Firstly, welcome to the new and improved Alice's Antics! It's a bit more chic, there's a drop down menu and I probably spent about 8 hours in front of my computer with a constant stream of coffee keeping me going. I really hope you like it! This weekend, week, month, I'm putting in extra effort to spend more time with my girl friends. As part of my boy detox, it goes without saying more attention has been thrown upon staying in with my favourite ladies or putting on our dancing shoes and going out for us, not for the male attention. It's pretty hard if you're single not to go out and constantly have a wondering eye, but as of lately I'm finding it so much more refreshing to go out and not really care about dancing stupidly or indulging in a late night pizza feast when we get back. After a week of doing just this, on Saturday it was my gorgeous friend Lucy's 20th birthday and we had the ultimate girls day. 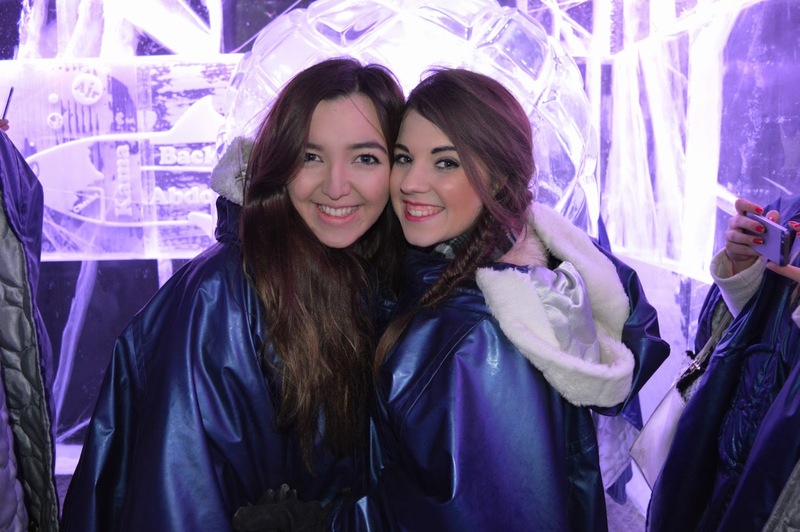 London is infamous for its clubs and bars and we booked in at half twelve (the day starts young) to the world famous Ice Bar. A bar made entirely of ice. When our time was up, we had the big debate of 'food or shopping' first. But our growling stomachs won us over and we headed over to Soho, where The Banana Tree caught our eye. The birthday girl had been there before and was very eager to return, which was reason enough for us to all follow suit, we were definitely not disappointed! I went for the Gaeng Keo Wan, essentially a prawn Thai green curry, and it was incredible! Unfortunately my eyes were too big for my stomach, but I definitely gave it a good go. None of us could face dessert, but the lovely waiters bought Lucy out a special birthday cake with a candle in it, so we all got to sing happy birthday to her! We left feeling very full, but of course, never too full for shopping! We wondered the streets of Soho before the pull of H&M, Topshop and French Connection dragged us into their lairs! Eventually the day had to come to an end, with all of us feeling exhausted. Bargains in hand (I can't wait to show you my French Connection coat), we clambered onto the tube and ended in Waterloo ready for our train home... and of course for some cake! I hope you like the new layout and you've all had wonderful weeks and weekends! Love the new blog layout! This post really makes me miss London! I'm in the same situation in terms of going out and dancing for myself and no one else. It is much more fun that way anyway! It's pretty, I like it. Also, I miss London. Hey Alice I love the new blog design! Although I do miss the little cartoon of the girl sitting on the suitcase. It was so cute! I am very jealous of you living in London and being able to do all of these things, it sounds so amazing! I always love spending time with girl friends but we always run out of new things to do together. As always I adore your blog!